The biggest tennis school in Albania, a school of champions. If you want to learn to play tennis you just have to come to the Tirana tennis club, and meet coach Fatos Nallbani. Mr.Fatos Nallbani is about 24 years old and he began to play tennis when he was 9. He is a descendant of probably the best Albanian Tennis player of all times, Mr.Sali Nallbani (see history). Mr.Nallbani began to coach tennis in 1995. He has coached many well-known Albanian tennis players like Penar Musaraj (Twice National Champion under 16, 1998-1999), Grid Voshtina (National Champion under 14 in 1999 ), Olti Mollaymeri (winner of Tirana Open 99 ), Andi Zajmi (National Champion under 12 in 1999 ), practically he has teaches only to champions. Coach Nallbani with the coaches of the Italian Experimental tennis school of Bari, Italy. Coach Nallbani wears a dark blue-coloured shirt. 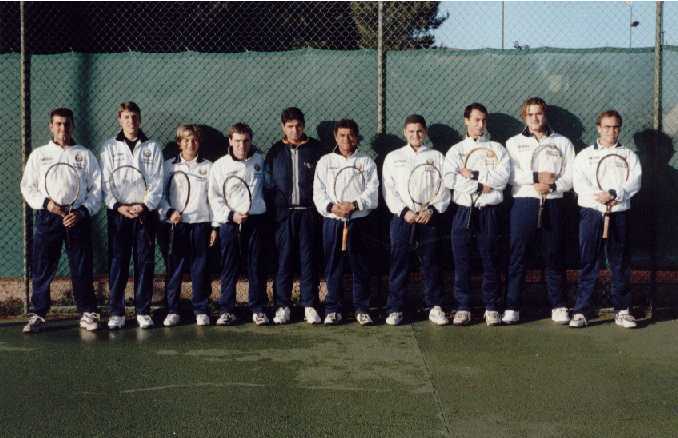 In November 1999, coach Nallbani participated in a specialization, an exchange of experience in the Experimental tennis school of Bari, Italy. This activity was made possible by Mr. Luca Santilli, responsible of tennis development in Albania. After this important expeience the two schools created a "twining", a league between these two schools. In the near future the schools will exchange their experience and will also make tournaments with students from both schools. The Tirana Tennis School thanks the director of the Italian Experimental school of Bari, Mr. Michelangelo dell'Etera, for this collaboration. Mr.Nallbani can be contacted at this phone number: 355 42 25441 or at enal@inima.al .